I am sorry but I am too lazy to write something :p Only : I hate the vector lines, they are to big, but the original clamp arts has big lines, so I couldn't make it smaller. Not bad! I'm not a fan of this type of vectoring, but this looks good. I like how the background and the character are consistent. The earring is truly entrancing. The texture is a nice addition. And an interesting way of writing the credits. Barely noticeable. i like that. very cool wallpaper, the detail to the waterfall, sword and person, I can see why it was elited, well done. so crisp and bright, quite refreshing. I really like your works. It's so smooth and the colors are very vivid. It's so simple that it makes me want to wall again without thinking of complexities. Looks great! Good work vectoring! Thanks for sharing! nicely done with this piece, love it! My critic is that it feels like a picture that was cropped too early, abruptly. 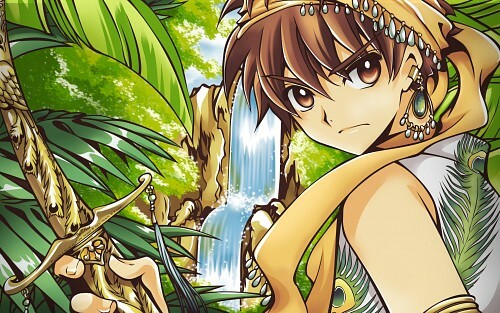 Meaning that I think that we should have seen a little more of Syaoran head, not all of it, but yeah, a bit more. Leaving the perfect details aside, I looked at the picture as a whole and that is how I genuinely felt about it. That said, the more I look at it the more I seem to be getting used to it, maybe that 'early cropping' sensation was only at first sight? I also had the first impression the background from Tsubasa too, I remember a similar scene from the manga (bought 16 volumes in a sold-out xD) so I was surprised being from something else. Anyways great vectoring here, colorful and also quite complex. You got so much better as I have seen some years ago. (not that they would be that bad too) Keep it up. I'm loving the colors, green <3 I really thought it was made from 1 scan. My favorite part is definitely his earing *3* it's perfect. Also the waterfall could look more watery, the lighting (white colors) should be more stretched out for example. Looks almost as ogirinal CLAMp artwork. I just found this wall and I must say it is fantastic!